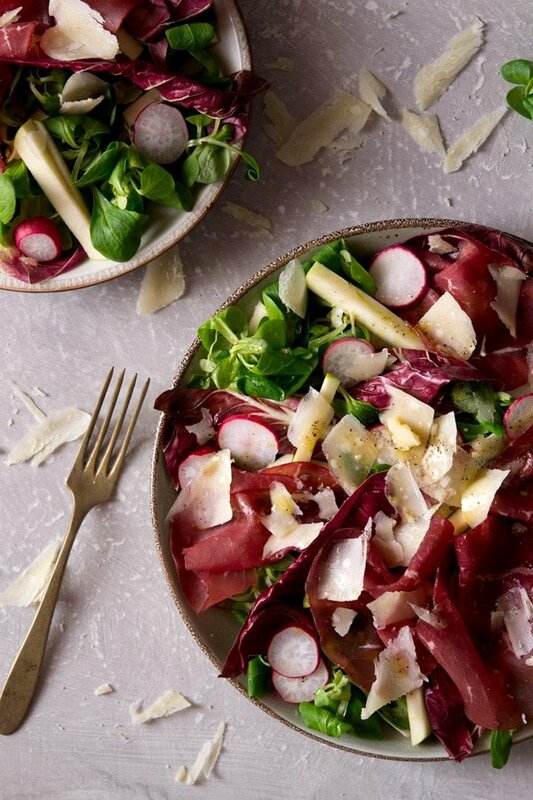 Bresaola salad with apple, radicchio, radishes and shavings of parmesan cheese topped with a simple, garlic and olive oil dressing. 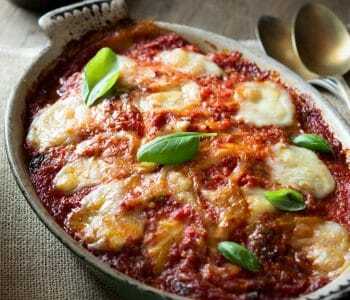 Perfect for lunch or as a starter. Bresaola (bresaola della valtellina) is a cured, salted beef from Valtellina, Lombardy Italy. It’s absolutely delicious eaten as an antipasto on its own, with some cheese, on sandwiches or in salads. Bresaola is one of those cured meats that I forget about quite often. It’s not as common as prosciutto, speck and salamis but is as equally as delicious. Whenever I do remember about bresaola, usually when I’m in a restaurant or bar looking for a quick sandwich or schiaccia it’s always incredibly delicious. I made this salad for dinner not too long ago and it was so tasty! Quick and light it was just what I needed in this hot weather. Bresaola is usually found in Italian salads with a combination of apple, a peppery salad leaf such as rocket/arugula or radicchio, radishes, olives, parmesan and nuts. I chose my favourite combination and I think that it works perfectly. The cured meat and salty parmesan go perfectly with the sweet apple and peppery radishes. It’s drizzled with a simple garlic, olive oil dressing that’s light and creamy. This salad is also great as a starter anytime of the year. First make the dressing, add the olive oil, vinegar, salt and pepper to a jar. Remove the skin from a large clove of garlic and pierce it all over with a knife and add it to the jar. Shake the jar until the dressing is light and creamy, set aside. You can also whisk the dressing in a bowl. Add the salad leaves to a bowl along with the radicchio. Finely chop the radishes and apple and add them to the salad and toss to combine. Arrange the salad on plates and top with slices of bresaola and shavings of parmesan. Sprinkle over a tiny pinch of salt and pepper then drizzle over the dressing (discard the garlic clove). We’re nearing to the end of summer and I have to say I’m so ready. We had an intense heat wave in Italy that’s only just calming down now, let me tell you it was not fun. Sweaty skin, fizzy hair, makeup melting off my face and not knowing what to do with myself was the norm for far too long. Today I woke up feeling normal for once and even managed to enjoy a cup of tea. 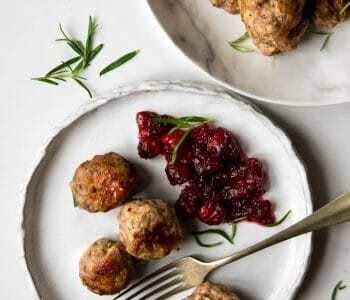 I’ve spent all morning dreaming about all the delicious, cosy Autumn/Winter recipes and I can’t wait to get cooking and share them all with you. For now, I’ll happily enjoy this cool, warm weather. To make the dressing, add the olive oil, vinegar and a pinch of salt and pepper to a mason jar or bowl. Remove the skin from the garlic clove and pierce it all over with a knife. Add it to the jar then shake it until light and creamy. If using a bowl add the garlic and whisk the mixture until light and creamy. Add the pea shoots to a large bowl, slice the radicchio, finely slice the radishes and apple and add them to the bowl, toss to combine. Arrange the salad on plates and top with slices of bresaola and shavings of parmesan. Add a tiny pinch of salt and pepper then drizzle over the dressing. Serve. I love apples in salad and this salad looks inviting, pictures are so nice! This sounds like a wonderful simple salad packed with colour and flavour. Love easy salads packed with flavors like this one! And your pics are awesome. Thanks for sharing!! What a beautiful salad!!! I love to make this for lunch!! !